Rates fall ahead of FOMC rate decision and GDP release. 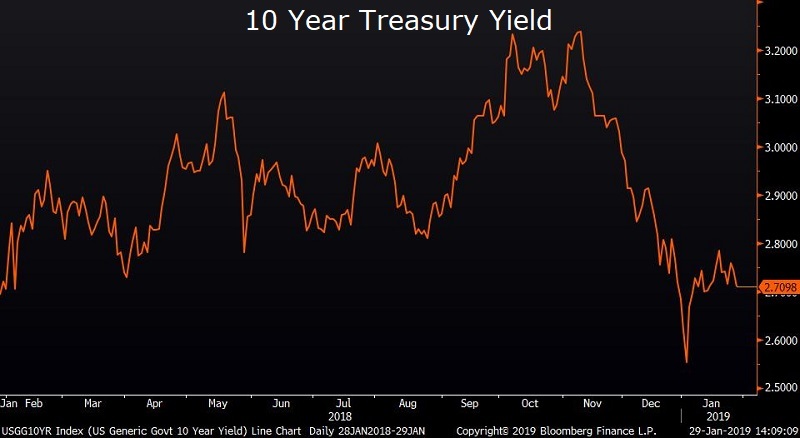 Treasuries rallied ahead of those key macroeconomic releases with 5 and 10 year treasury yields falling 4 basis points to 2.54% and 2.71% respectively. While no policy change is expected from the FOMC, Fed officials will likely underscore their patient and data-dependent approach toward additional rate hikes. The Fed’s task of assessing the strength of the economy has been complicated by the absence of economic data since Christmas due to the government shutdown. Tomorrow’s preliminary GDP report for Q4 is expected to show that the U.S. economy continued to downshift in the final quarter of last year as growth slowed to a 2.6% pace after expanding at a red hot pace of 4.2% in Q2 and 3.4% in Q3. Trade still looms as key issue for markets. The Wall Street Journal today reported that Chinese Vice Premier Liu He will only offer the U.S. “modest policy reform” while rejecting deep structural changes. Meanwhile, Treasury Secretary Steve Mnuchin hopes to end the trade war with China, saying “everything is on the table.” The trade talks come amidst a slate of disappointing economic data for China, and as US earnings season kicks off. 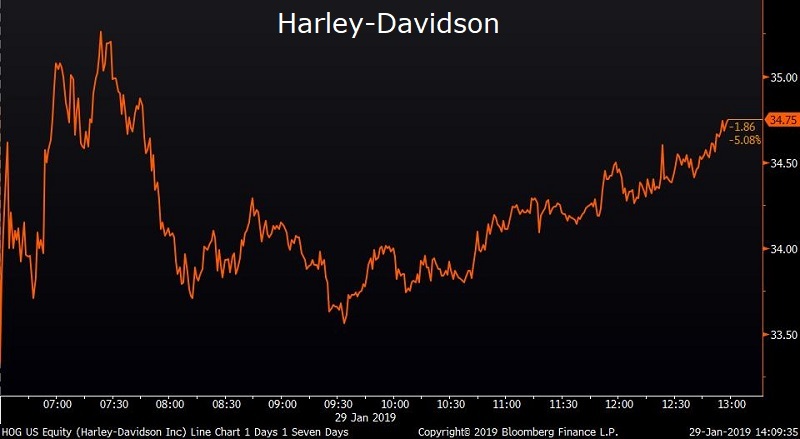 One such company, Harley-Davidson, has already stated that it expects new tariffs to cost it $120mm in 2019. The US motorcycle maker reported disappointing fourth quarter earnings and ended the day down 5.67%. Home prices continue to decelerate. 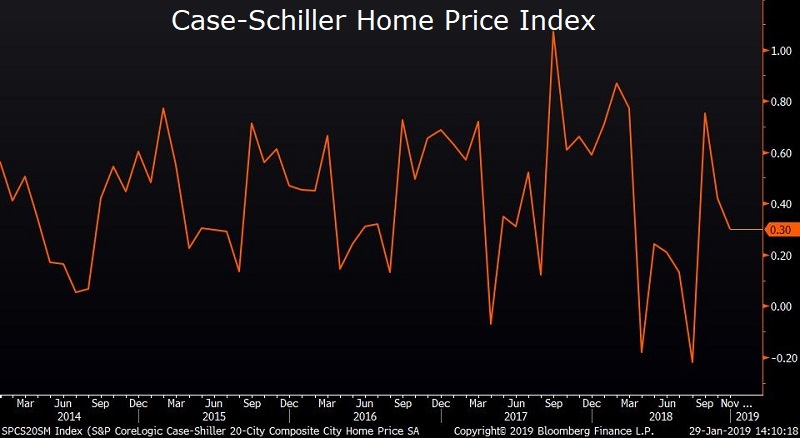 The S&P Case-Schiller index increased at an annualized rate of 5.2% in November, down slightly from 5.3% in October and down further from the peak in the spring of 2018. Las Vegas, Phoenix and Seattle saw the largest annual price gains. Economists attribute the slower pace of price appreciation to rising mortgage rates which have dented affordability. UK Prime Minister May reopens Britain’s withdrawal deal with the European Union. The move is widely seen as the “last throw of the dice,” with one political ally going as far to say “this is it.. it’s 5am in the casino”. The prime minister herself has acknowledged that there’s “limited appetite” for any significant changes to the last deal she negotiated. 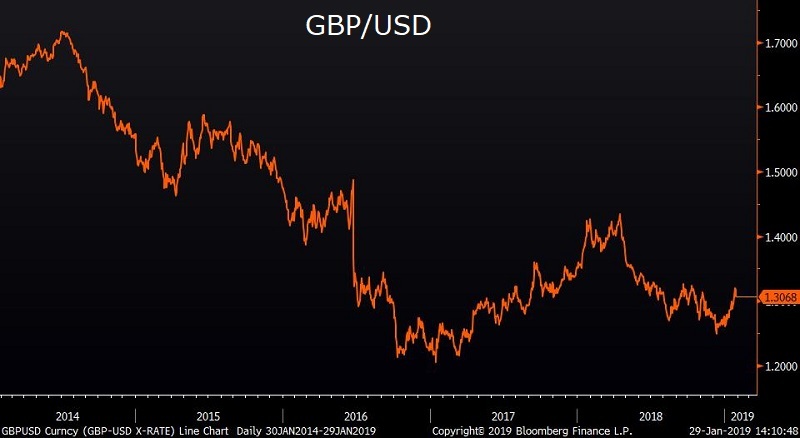 The British Pound weakened against the dollar to $1.308.